The control software supports so-called “hot keys”, i.e. you can trigger specific functions on the keyboard and even determine which keys should do this. The default settings include the arrow key on the number block for manual drive (jog), allowing you to change the tool position without moving to the configuration page at any time. In order to prevent unintended typos from triggering machine movements, all hot keys are deactivated while the text entry field are activated. The hot key dialogue can be used to change the assignment of the keys. As not all keys are assigned to a visible symbol, the assignment via a „Key code“, which is difficult to remember, which is why the learn functions are used. 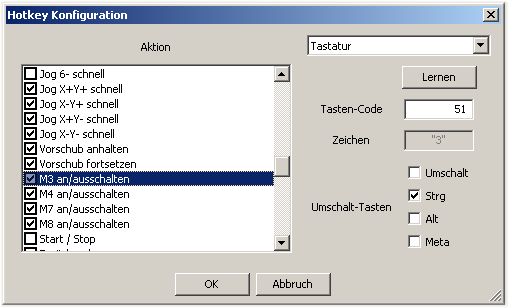 First select a function be selected from the list to the left and change the function in the upper right from „Not assigned“ to „Keyboard“. If the „Learn“ button is pressed, the code for the next keys will be determined and entered. The manual travel (jog) has a large number of possible key assignments, a key is not available for every direction, but multiple possibilities are also available for the speed. The functions without speed entries leave the speed at the most recently set value. The functions (fast or slow) on the other hand influence the speed. The keys can thus be assigned so that an arrow key without shift means continue at the current speed, the same key with shift triggers the rapid traverse and the same key again with the CTRL key triggers slow travel.